In an attempt to create a more intuitive buying, selling and search experience, eBay has announced, as part of eBay Spring Seller Update 2015, changes that will be applicable to product listings and auctions. From May 1st, 2015, eBay community will be required to participate in what is anticipated to give greater visibility to products and revitalize auctions. The official announcement claims that this step will enable eBay sellers to succeed by creating high-quality listings that turn the millions of eBay browsers into buyers. These changes are designed considering that Google has all the required data in the most effective format to make the products more visible, thus improving buyer experience and in turn, help sellers increase their sales, too. The most important part of publishing products online to Google Merchant Center is ensuring that they have all the data the Google requires to match. Inappropriate data may return errors and will not successfully publish your products. Now though this may seem like a herculean task, it is strongly recommended to NOT invent false GTIN information. These dummy / false numbers may allow temporary success publishing but it may lead to Google Merchant Center account suspension. 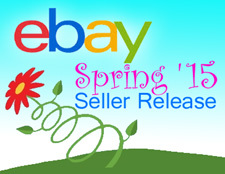 eBay’s Spring Seller Update 2014 had made a request to eBay store owners to list this kind of information going forward. However, the 2015 update is a mandate, not a request anymore. eBay sellers, now set some time aside to review your current listings and fill in the gaps to adhere to the new style guide. 1st May is just around the corner! In addition to updates to categories and product specifics, eBay is also about to revitalize the auction market. The variability of auctions makes it complicated and time intensive to develop a business strategy for the same. In a scenario, where the market (bidders) decide the price of the product, perhaps your best attempt would be to increase the number of visitors to your auction. Auctions have a tendency to drive down your profits and in order to get maximum advantage of the auction-style format, eBay will introduce some strategies for all auction sales. The main idea is to discourage the shorter duration auctions which are considered least successful. 3) The 10-day duration on auction-style listings will no longer have an additional feature fee. 5) Fixed price listings in media categories will no longer have a separate insertion fee. 6) Reserve price will increase. This feature fee will increase in price to the greater of $3, or 2% of the reserve price (the minimum price that must be met for your item to sell), with a cap of $100. 7) For eBay Stores subscribers: a new final value fee cap of $250 in select Business & Industrial categories, including Heavy Equipment. To conclude, online business is getting more and more dynamic and marketplace strategies can change every year or even multiple times within a year. The balance of elements is a must to any success and more so in an economy driven by giant marketplaces such as eBay and Amazon. Play your cards right!